Sorry about the off-topic post, but this is the best channel I have for reaching the academic world. Whatever Robert Frost may have said, something there is that really loves a wall. Specifically, fear does. The fear that looks askance at every foreign-looking person, that puts fortifications on our borders, that sees only the danger in contact from others. A small, non-violent (with perhaps an exception or two) mob assailed Harvard Yard last Thursday night, and Harvard gave in to fear. The gates were shut or put under guard for the night, which may well have been necessary. They’ve remained that way ever since. 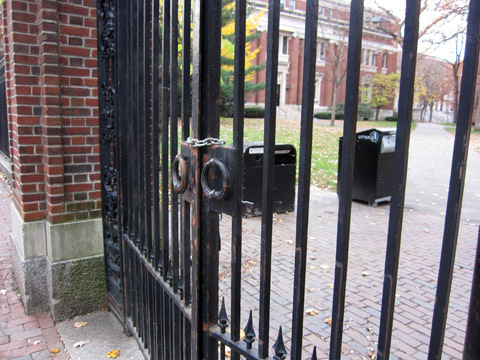 To get into Harvard Yard, you must show an ID or have an invitation. Today employees received an email giving the weekday and weekend schedules for the gates, suggesting this won’t go away quickly. This is inconvenient for Harvard people and more so for others who have reason to visit. The tours of Harvard Yard are on hiatus. If you have an appointment or a conference, your host has to provide a list of the people attending so they can be allowed in. Lamont Library contains a repository of government records which is open to the public without an ID — but you can’t get to Lamont. I don’t know how long this will go on. When vague fears drive a policy and no risk is too small to ignore, there’s no reason ever to stop. This entry was posted in off topic and tagged Harvard. Bookmark the permalink.